The second installment due date of 2017 Lake County property taxes is approaching. Please note, you received one bill in May, and you will not receive another bill for the second installment. If you misplaced your second installment coupon, print a copy from the Treasurer's Office website by entering your PIN number or address. If you are mailing your payment, be sure to have it U.S. postmarked on or before Sept. 6 to avoid late penalties. Do you have questions about your Lake County property tax bill such as who determines your taxes and what are the different ways you can pay? Watch this video as Lake County Treasurer David Stolman answers these and other commonly asked questions. Watch now. Learn more about what Lake County does with your property tax payment, property tax relief that may be available to you and more by visiting lakecountyil.gov/propertytax. The Paratransit Market Study for the Lake County region is concluding. The study evaluated transportation options and service gaps for seniors, people with disabilities, and the general public. Please attend one of the final round of community meetings to learn more about the study and to provide feedback on the study recommendations. 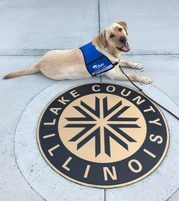 Community meetings will take place Sept. 5 and 6 in Libertyville, Waukegan, Round Lake Beach, and Barrington. Find out more. Have A Great School Year, Lake County! Students will soon be returning to the classroom, so let’s make sure they are safe this school year! This means keeping an eye on the road for school buses and students walking to school and making sure students stay safe by using their technology responsibly. Watch this video as the Lake County Sheriff’s Office gives you safety tips. Lake County residents correctly registered with their current name and address can now complete the required application to request a ballot by mail for the Nov. 6, 2018 election. This is an ideal voting option for snowbirds, students away at school, and those who will be traveling on Election Day as your ballot can be mailed anywhere. Completed applications must be submitted to the Clerk’s Office by noon Nov. 1. According to Illinois state statute, ballots cannot be mailed to the voters until late September. Emailing your name and address to VotingbyMail@lakecountyil.gov. How do the seasons of the year impact our food? Join us Aug. 29 at Bonner Heritage Farm in Lindenhurst as we learn about the history of the site, life in the 1800s, and where our food comes from. Kids will enjoy fun hands-on activities, games, gardening and more. Register today! Help reduce overpopulation, win cash prizes and fish to your heart’s content at Carp-O-Rama on Sept. 8 in the South Bay of Independence Grove Forest Preserve! 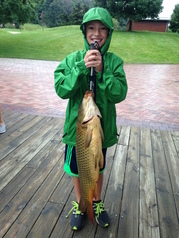 Compete to catch the most carp by weight and the largest single carp by weight. Learn more.